the shuttle pro v2 is a very nice tool to increase workflow, or to start getting workflow.. and after my experience it works in video editing areas same as in music production while I think the main focus is on video editing. lets do video cuts with about 20 marks (or more) then I m sure you agree with me how precious this device gets. if not maybe after 10 videos of that kinda scenario. that makes 200 cuts in sum. 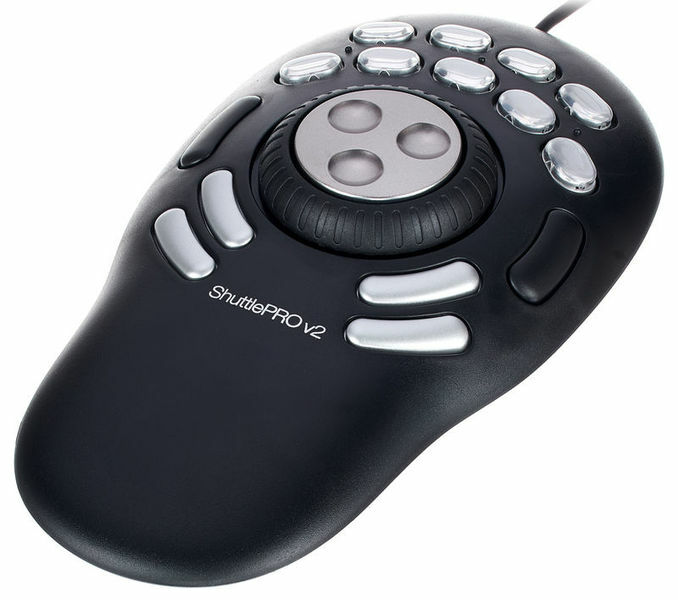 I can work and work over and again with this tool without getting insane by clicking, and clicking and youknow..
video editing is comfortable with this little control unit, sure but it also works well with cubase 9 and additional to all functions I got a solid and well holding build quality. when I ordered the device I didnt expect a very solid build and high quality buttons and control elements. I thought no not at this price. but obviously the manufacturer wanted to do users and customers a favor. This is probably software related (tested it in Premiere, After FX, Ableton and more) but that doesn't stop them to sell this product as a shuttling gear, so even if it is software's fault, that didn't stop them from throwing this in the market. ID: 161864 © 1996–2019 Thomann GmbH Thomann loves you, because you rock!